Where will you be in one year? No, I am not claiming to be a foot model Lol. 😂 I just want to celebrate the one-year anniversary of my right foot bunion surgery. These were not an injury. I have had them since I was a kid. When I was ten years old, I remember seeing a foot doctor, and being told that one day, I would need surgery. Well a year ago today, that day came. Overall, the invasive surgery went well. It did take longer than expected because the damage on my right foot was pretty bad. The first 48 hours post surgery was the worst. I'll spare you the story, but like the pains of childbirth, it was so worth it. 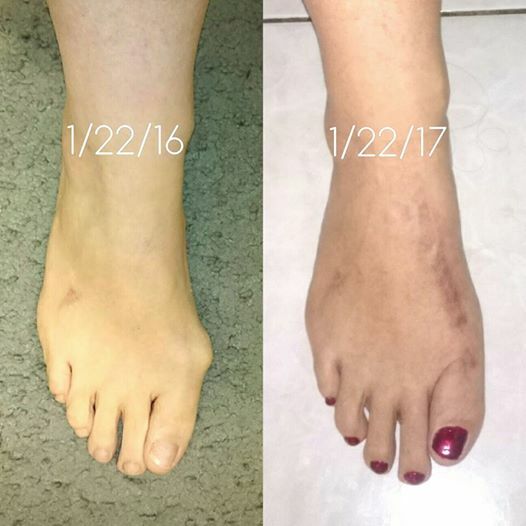 In 2013, I got consultation on my feet,because I had just lost 100 pounds, and they were hurting daily (you'd think less weight would be better). The x rays showed the future need for surgery. In 2015, I committed to fitness as my next stage after weight loss and a two year maintenance. I started working out but I could only stand up for one worship song at church. My feet were getting bad fast. So Dec 2015, the surgery date was set for January 22, 2016. If you are thinking of or having surgery, message me and I can give you a few key tips to it all. My top advice is physical therapy but it's got to be the right kind. Today, I can stand for all worship. I can do jumping jacks!! I'm still modifying other exercises, but this victory is huge! Today, I thank my family for supporting my decision and need for the surgery. I am so glad that I have an amazing group of people beyond my family that help me become a better me daily. To many women and moms out there, please never feel guilty or like you are inconveniencing your family to take better care of yourself. Self care is so important. STOP putting you and your health and your needs last or never! Many people love you and they too want the best you possible daily! Make the time, spend the money needed for your needs, especially the need to live your days as best as you can. I support you and here publicly advise you to make a plan/schedule for you and then share your goals with your loved ones so they can support you. So everyone is on the same page so you don't feel alone or like you're going up stream. Life flows much better when you have your ideas, plan them out, share them with loved ones, and act on them as soon as you can. Life is way too short to have should of and would of in your life. I'm here to cheer you on if you need! Support increases your success. I know it.